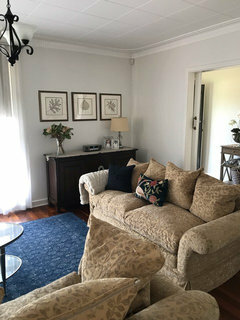 Does anyone know of a washable neutral linen for loose sofa covers in Australia? 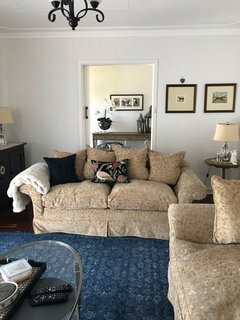 Are you in Sydney and what are you looking to slipcover (loose covers)? I offer a slipcover making service and have the perfect fabric in mind. Louise, Decoro Custom Interiors - Window Treatment Specialist, Sydney. Hi Louise, thanks for that. yes I am in Sydney wanting to do slip covers. I do have an upholsterer though. Where abouts in Sydney are you? Hi Dale, I’m based in the Upper North Shore. For anyone looking for a linen colour without the continuous washing or ironing, be it a slip cover or re-upholstering a sofa, consider a crypton fabric. I have this on my sofa at home in Warwick's Tritan plains colour 'Pebble' (I sell club and hotel furniture so use crypton a lot). Its water repellent so liquid spills can be wiped off before it penetrates the fabric (less washing) and is washable if it gets dirty. Its a great alternative to linen because you can have the light colour and weave texture but without so many headaches with maintenance. The only drawback is it does not have any stretch like normal fabric so may not be able to be made in slipcovers for all sofa shapes. There are many Australian suppliers of cryptons but the best for price per meter and colour range are Warwick and Wortley Group. What colour is your sofa?